Don’t you just love it when a book surprises you? Sometimes the surprises begin with the first line, but sadly, they end there as well. Other times, the surprises just keep coming from cover to cover, and keep the reader guessing what will happen next. 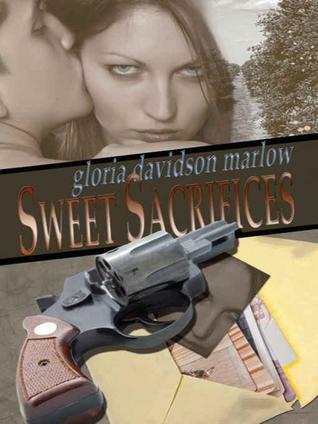 Gloria Davidson Marlow’s “Sweet Sacrifices” belongs, I am happy to say, in the second group. A tale of love requited and unrequited, of mysteries and intrigues, and of layers and layers of family secrets, it kept me not only interested but entertained throughout. “Sweet Sacrifices” is, at its core, the story of a poor, beautiful young teacher who falls in love with a handsome stranger, believes that she has married him, becomes pregnant, is betrayed by him, and is then coerced into marrying his brother in order to insure that her infant son has a better life, and a better father, than she did. Oh — and it also turns out the man she thought she had married, as well as his entire family — are enormously rich. And loaded with family skeletons in a variety of closets. Admittedly, that is a gross oversimplification of the story. But should you decide to read this book (and I really think you should, especially if you like romantic suspense novels), I don’t want to give away too much of the plot. Ms. Marlow has populated her novel with a cast of characters that seem to grow in depth and believability the more we get to know them. There are heroes and there are villains, of course. But the author rises above the mundane and predictable by giving her characters multi-dimensional personalities. She elevates them from the world of the cardboard stereotypes that populate the books of many less talented writers, into the realm of believable, individual people. Another pleasant surprise for me was that “Sweet Sacrifices” has an almost gothic feel to it. There is a sense of oppression, of captivity and isolation that is so much a part of gothic literature. There is also the hint, and even the reality, of madness. Things are not as they appear. People may — or may not be — who or what they seem to be. Danger and betrayal lie around every corner, and the danger keeps growing. That is another thing I enjoyed about this book: the way that the story kept developing, and how just when I thought I had it figured out, the author would throw in a clever twist, some new bit of information that spun the plot in an unforeseen direction. And her plot twists are not just random devices tossed in as a gimmick to hold the reader’s interest. Once they have been revealed, they make perfect sense and fit seamlessly into the storyline. I love it when a book comes along and surprises me. When it leads me on a winding path filled with growing suspense and increasing tension from page to page, and pays off with dividends in the end, I love it even more. “Sweet Sacrifices” did all that, and did it very well. Gloria Davidson Marlow is the author of several romantic suspense novels. She resides in Northeast Florida with her husband, works as a paralegal at a local law firm, and spends as much time as possible with her three grandsons. Visit her blog or her website to learn more. You can also follow her on Twitter. Kerry Hartjen is a former magician/clown/actor and an award-winning writer. He is a supporting member of the Horror Writers Association, a former member of the Dramatists Guild of America, West, and a graduate of The Hollywood Scriptwriting Institute. His poem “Homecoming” has just been published in the fourth issue of the online literary journal, HelloHorror.com. Kerry currently lives on a small island midway between Seattle, WA, Vancouver, B.C., and Victoria, B.C. with his wife and their cat, Max. His blog can be found at: www.raviolithewriter.com . This entry was posted in Guest Review, Uncategorized and tagged book review, discover new books, gloria davidson marlow, guest review, novel review, reading, romantic thriller, sweet sacrifices, the wild rose press.